A line of classic Alfa Romeos at Pebble Beach, where automakers' sales pitches are increasingly part of the scene. MONTEREY, Calif. -- Every August, about 15,000 of America's wealthiest car buffs stroll the misty golf greens of Pebble Beach in Guccis, sipping chardonnay and admiring lovingly restored, flapper-era Morgans and Rolls-Royces and pre-war Bugattis. But vintage-schmintage -- the auto industry has business to conduct at the Pebble Beach Concours d'Elegance. 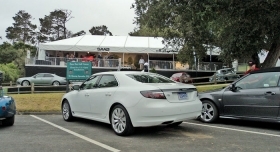 Automakers and vendors have zeroed in on the Pebble Beach lawn party as a golden opportunity. In increasing numbers, they come to take orders for new models, conduct consumer research, pitch business, make news about product plans or just try to conjoin their names with the hard-to-reach moneyed set. Scott Painter, founder of the online buying site carsdirect.com, hosted an open-air hospitality suite with champagne and hors d'oeuvres. On a large-screen computer monitor, Painter was giving demonstrations of his newest automotive Web site, truecar.com. He proposes to aggregate transaction prices in real time from around the country to give auto dealers and consumers the "true prices" being paid at the moment. "All the people at all the highest levels we deal with are here," Painter explained, looking out over foggy Monterey Bay and a fairway where thousands of people strolled among Pierce-Arrows, Duesenbergs and Alfa Romeos. "If we're not accepted in this community, I don't know how we will pull it off," he said. But now, as one regular noted, waving his hand toward a hillside of tents and platforms and new-product displays that overlooked the weekend gathering, "It's getting a lot more commercial." Last year at the Concours d'Elegance, Spyker Cars was largely alone and unnoticed. This year, it brought a grandstand of cars and offered test drives of the new 9-5, which it acquired this year along with the rest of Saab. Those that were present and accounted for there tell a story of the current luxury market. There was Spyker Cars, a Dutch maker of exotic sports cars controlled by entrepreneur Victor Muller. One year ago, Spyker sat by itself in a hillside tent, largely unknown and unnoticed. This year, the automaker's display was an imposing grandstand of cars featuring Spykers side by side with Saabs, the Swedish brand Muller saved from extinction in February as General Motors Co. prepared to kill it. Saab offered test drives in the new 9-5 sedan, reminding the crowd that the car is now back in dealer showrooms after a seven-month production halt. Nearby was Lexus. It has been aspiring to broaden its marquee with the F performance subbrand. Under the shade trees on the hill sat a showroom's worth of F cars, including an LFA model that will retail for about $375,000. A few steps away from Lexus, as though glaring at it covetously, sat one of the U.S. market's most undeniably nonluxury brands, Hyundai. But Hyundai Motor Co. will challenge that identity in November by releasing the Equus, which it intends to go head to head with the Lexus LS 460 L flagship with a price tag of around $60,000. Nearby was a Cadillac display -- one of two at the Concours, just in case showgoers missed one. One featured the SRX crossover, while the other allowed visitors to crawl in and out of a 2011 CTS-V coupe that gets 552 hp and has a $70,585 window sticker. Most visible along the hillside and indeed throughout much of the show was Infiniti. With an enormous white tent, a large sign and a field of models awaiting test drives, Infiniti beckoned visitors with a gourmet canape and wine tasting prepared by restaurateur and TV chef Scott Conant. Infiniti also used the Concours for two product world debuts, the sort of thing that usually fights for attention in the media chaos of a major auto show. Infiniti showed crowds the new G25 sedan, which will serve as the brand's entry model, as well as the first offering in Infiniti's new performance subbrand, the Performance Line G coupe. "We're laying the seeds," said Ben Poore, vice president of the Infiniti business unit. "We find that the more people are exposed to who we are and what we're about, the more positive their feelings about us are." 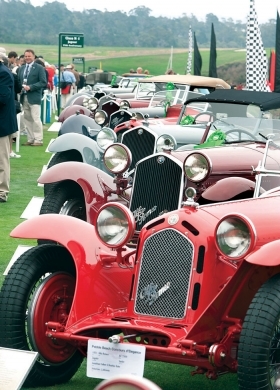 Pebble Beach's well-heeled patrons drew automakers with various agendas. Far from a golfing boondoggle, the Concours and overlapping events make for a weekend of work for auto executives. While it makes no pretense of selling luxury cars, Ford Motor Co. used the vintage racing event at nearby Laguna Seca raceway to unveil the 2012 Mustang Boss 302, a roaring 440-hp package that has been out of production for 40 years. While collectors revved the engines of their restored Ferraris and McLarens, Jim Farley, Ford's head of global marketing, stood in a garage straining to be heard. "This is where Ford should be," Farley said. "This is where people celebrate cars in motion and the heritage of racing. We want to remind people that that's our corporate DNA and that it's not just part of our past; it's part of our present." Nearby at The Quail, another golf course vintage auto event for well-heeled connoisseurs, Land Rover was busy selling cars and conducting market research. "We sold two today," Finbar McFall, vice president of marketing for Land Rover North America Inc., said of his display of vehicles. He quickly clarified that he had appropriately directed the buyers to a franchised retailer for the actual transaction. "It's a great event for us," McFall said as passers-by signed up to test drive his vehicles. "Everyone here is a car fanatic." McFall was also taking notes and carefully listening for consumer feedback on a 2011 model package Land Rover is marketing called Autobiography. The limited-edition SUVs feature burled wood and interior color options that allow buyers to create a more personalized look -- at a price tag of $122,950. Land Rover was seeking feedback about changes to the model's exterior. "It's a bit of a study at the moment to see what reaction we get," McFall said. Just down the street, Porsche was having even more intense consumer conversations about a planned new model called the 918 Spyder. The 918 Spyder is still technically a concept car, a proposed hybrid plug-in unveiled in March at the Geneva auto show. But Porsche AG is scrambling to get the roadster into production. The car boasts a 500-hp V-8 engine and claims an astonishing 78 mpg. Porsche's board agreed to build the car if at least 2,000 customers committed to buy one. And in late July, having received enough hand-raisers, the board green-lighted commercial production. Its price tag has not been revealed; uncorroborated car buff speculation has put it anywhere between $100,000 and $650,000. Although the car is still far from production-ready, Pebble Beach became the moment to sell it. During the Concours weekend, Porsche representatives picked up interested 918 Spyder customers and shuttled them off site to a nondescript airplane hangar at the small Monterey Peninsula Airport. There, the car was showcased like a stolen Rembrandt. For dramatic effect, the dark hangar had been redone with all-white walls and floor. Visitors entered and walked around a wall to find the Spyder sitting on a raised platform, bathed in an acid-green light. Amid the surreal environment, a large-screen TV monitor silently showed images of the car in motion. But Porsche has more riding on the presentation than just blowing the minds of potential customers. An automaker with an image for speed rather than fuel economy, Porsche faces the same tough new fuel economy standards as the rest of the industry beginning with the 2016 model year. And Porsche intends to meet the new standards on its own, not averaged in with its parent company, Volkswagen, said Dave Engelman, product communications manager for Porsche Cars North America Inc.
"There's no way we could reach the new requirements in 2016 without this car," said Engelman, standing in the bright California sun as customers test drove other Porsche models. "We've had 900 people come in and give us deposits on the car," he said. "And we haven't even said how much it's going to cost."